2. Cut the loaf into 2 -3 cm slices, not slicing the loaf completely. 3. Add minced garlic to the butter. 4. Add seasoning to taste. 5. 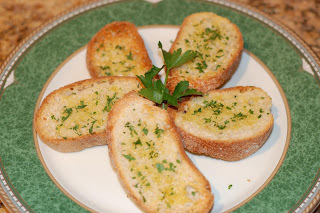 Add the garlic butter in the gaps, spread remaining butter over the loaf..
6. Sprinkle with grated cheese and some sesame seeds on the loaf. 7. Wrap in a foil and seal the ends.Place in the centre of the oven and bake for 7-10 minutes. 8. Remove from the oven carefully and serve unwrapped. adding some cheese also makes it better!